Leaving town for a week made me notice the changes in the Sign’s appearance more than I might have if I had been within sight of it the whole time. Yesterday the “H” appeared blueish as it was stripped of paint; today a platform appeared in front of it as it was painted. This evening, the first “L” appears blueish in the evening light. 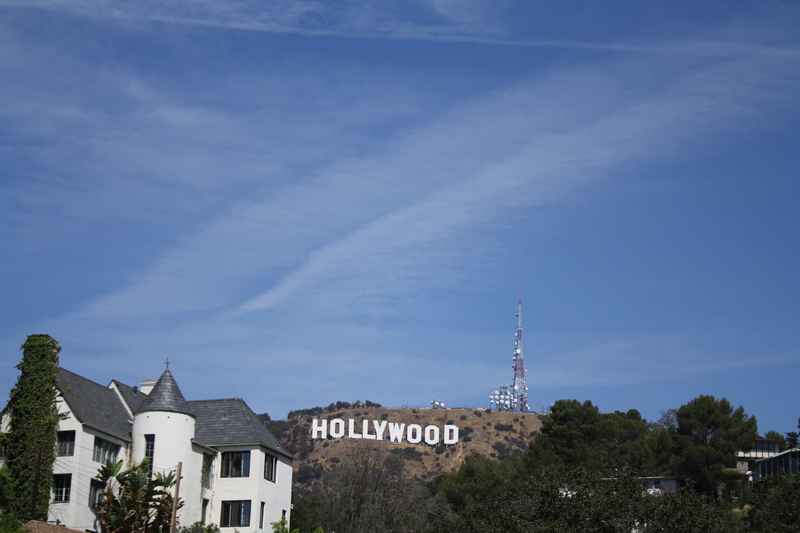 For a static monument, the Hollywood Sign is remarkably changeable. It can look narrow and almost delicate when viewed from the east or west, and massive when seen from the south. Its paint captures changes in light, so that it can appear blindingly white, golden, grey or even pink, depending on the time of day. 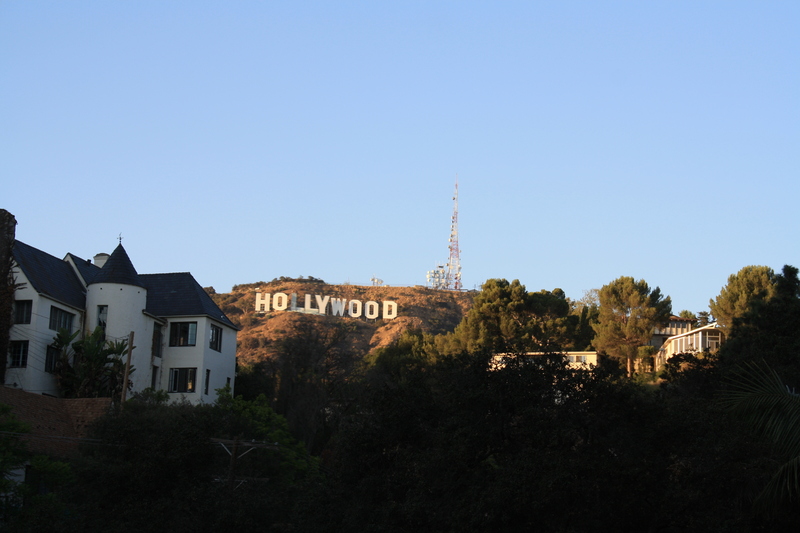 In its current restoration, a run-up to the 90th anniversary of the original Sign (and Hollywoodland itself), it is even more mutable than usual, and to my eyes more fascinating. Today marks the beginning of a major renovation of the Hollywood Sign, the most extensive in the 34 years since it was rebuilt. The Sign will be stripped of paint, pressure-washed and repainted, a process that will take 10 weeks. It needs it. When I was up there being filmed (legally!) in June*, I was struck by its weathered condition, most of it the result of graffiti and attempts to paint over it. In other Hollywood Sign news, Hollywoodland residents have been dismayed to find that Apple Maps–for all its mistakes–directs tourists up the very streets that have been the scene of total gridlock and collisions. The situation had been getting better, thanks to the efforts of individuals and homeowners’ groups to persuade Google, Mapquest and other GPS providers to feature other, safer routes toward the Sign. Along comes the iPhone 5 and the software update for other Apple phones to undo all of that. While no one who lives near the Sign wants to deprive people of a photo opportunity, this residential neighborhood of narrow streets and blind curves is not the place for it. Having narrowly escaped several head-on collisions with cars driven by non-residents, I can only hope that Apple will respond to our pleas and do something. Our safety depends on it. 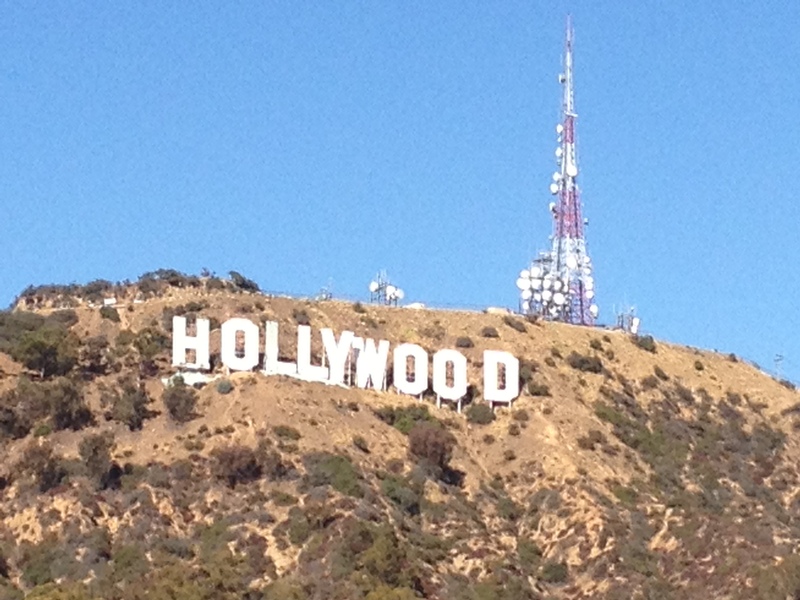 You are currently viewing the archives for October, 2012 at Under the Hollywood Sign.